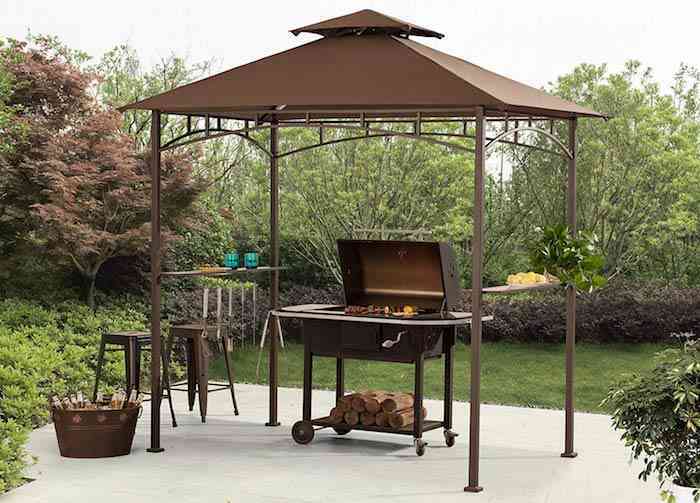 Grill gazebo or grillzebo is basically a gazebo to keep grills and grilling tools. It helps to prevent premature rusting of your favorite grill. Also, you get a dedicated space to keep all your grilling tools. And more importantly, a grill gazebo also shades you while you’re preparing delicious bbq dishes. So today we are here with our best grill gazebo reviews to make your summer grilling sessions memorable. Barbequing outdoors is perfect for summer or even in chilly winters. Most BBQ cooks like to use wood pellet grills and electric smokers to cook ribs, chicken, turkey, and vegetables (vegan BBQ). As grilling in open can trouble you during sunlight and might also put natural dust in your grill in the night. To avoid such situations, having a grill gazebo which covers your grill and you during the process is the best choice. We asked in our BBQ community to suggest some of the best gazebos they use outdoors. Among these suggested units, we found these 11 among the best grill gazebos that you can buy with confidence. So let’s get to the grill gazebo reviews, and find the perfect unit for your outdoor BBQ. Its time to show your grilling techniques under the cool shade of sunjoy grill gazebo. The sturdy aluminum and steel construction of sunjoy lets you cook food peacefully. Besides providing durable construction, its rust-resistant, powder-coated finish will stand up for years to come. So if you’re looking a product for long-term use then this is the best grill gazebo for the purpose. Thus, you’ll get plenty of cool shade while you cook food for your family and friends. 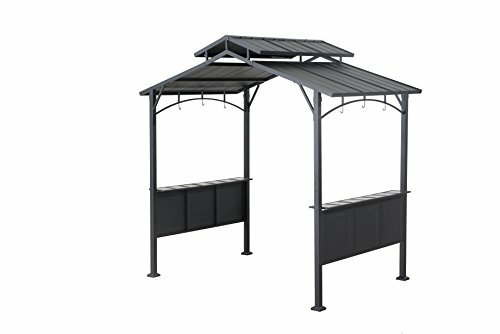 In order to protect you from harmful UV rays of the sun, sunjoy grill gazebo features soft-top canopy. In spite of having a soft top, it remains stable and tough through all weather conditions. Thanks to its vented, two-tiered design that allows wind to pass through. This proper flow of air keeps the unit steady during high winds. It even maintains coolness during high summer temperature. Hence, stability and toughness of the unit make it the best grill gazebo from sunjoy. Love to grill after sunset? 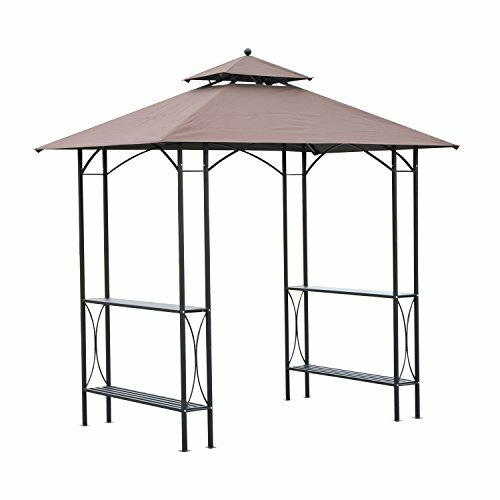 Not to worry as sunjoy gazebo have your back. The stylish led lights on the corner will bright up space under the canopy. These lights are bright enough to see what’s cooking in the grill. Apart from that, it comprises of 2 handy shelves to keep beverages, spices or food. And an in-built bottle opener to open bottles ongoing. 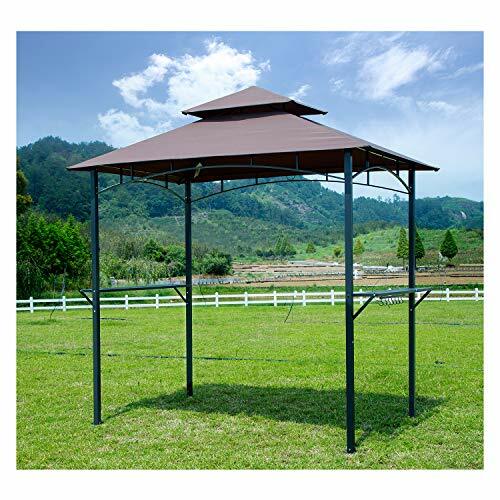 Therefore, user-friendly design and sturdy construction make it the best sunjoy grill gazebo. If the quality of a product is your first priority then you’ll surely like this sunjoy hardtop grill gazebo. In spite of having a soft top canopy cover, it comprises of a durable steel frame. And the benefit of having hardtop canopy over the soft top is, it remains stable no matter how the weather is. 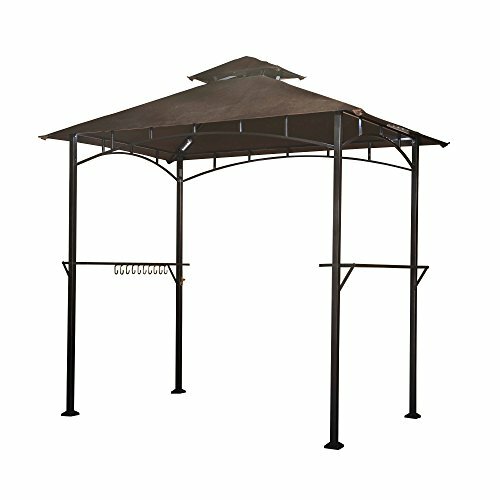 Be it mid-summers, snowy winters or heavy rainfall, this hardtop grill gazebo will provide you with shade. Thus, you can cook delicious food all around the year without worrying about harsh weather conditions. Lattice framing on one side of grill gazebo gives you a convenient place to hang your grilling tools. While built-in glass hangers on the other side let you store wine glasses conveniently. In addition to that, side shelves make a perfect place to rest plates, beverages, etc. In short, it is the best hardtop grill gazebo to enjoy moments of grilling with family and friends. Whereas, strong steel and aluminum construction are rust-resistant that will stand up for many years. Good ventilation on hardtop canopy maintains optimal airflow underneath. In fact, it takes away smoke arising from food as well as keeps the area cool. And as it is a hardtop grill gazebo, it is strong enough to withstand heavy winds and rainfall. Other than that, it is very easy to assemble the unit. You may need a hand to put the unit together as steel parts are too heavy to handle alone. It will hardly take an hour to put it together as instructions on manual are clear and easy to understand. Tight on a budget but want a good outdoor grill gazebo? Do not worry friend, we have your back. The GoJooasis barbecue grill gazebo is perfect for those who love to spend summer trying new barbecue skills. But don’t let the inexpensive price of product confuse you with its qualities. In spite of being cheap, it comprises of rust-resistant, powder-coated steel frames. These frames hold the entire unit firmly during high winds and rainfall. So no need to worry about the quality of the product. A hook on the center of the frame is ideal to put a light, fan or any decorative item. Whereas, two iron mesh tables on the side are perfect for keeping plates and beverages. 7 pegs on side of frame conveniently store wine glasses. And lastly, you get a bottle opener attached on one of the legs to open your beer bottle on the go. All of the features simply make it one of the best bbq grill gazebo on the review list. Sometimes people are so indulged in grilling that they often forget about the setting sun. But darkness is no longer an issue with kozyard 8 x 5 soft top bbq grill gazebo. Thanks to its magnetic detachable led lights. Presence of magnet on the back of led lights allows you to put them wherever you like. And as they work on batteries, you longer need to worry about wiring. Simply re-position them in order to get the maximum amount of light under shade. This user-friendly feature of kozyard makes it the best grill gazebo with lights. Similar to the majority of units on our best grill gazebo reviews, this grillzebo also comprises of metal shelves. Both these shelves are safe and convenient to rest grill accessories, plates, and drinks. Furthermore, fire-retardant, vented double-tier top canopy ensures the safety of a user beneath the shade. It also helps to maintain cool temperature by letting go of warm air. Thus, you can show barbecuing skills to your guests under the cool shade of kozyard soft top grill gazebo. The 180 gsm PU coated polyester cover is easy to clean in case it gets dirty. Plus, it also protects your grill from rain apart from direct rays of the sun. Moreover, the combination of the modern and classic design of the unit will look absolutely beautiful in your backyard. And sturdy steel construction of unit prevents it from tipping over due to high winds. Overall, kozyard gazebo for the grill with lights is perfect for summer outdoor cooking. The fun of spending time under grillezo doubles when an assembly is easy. So we have this 8 X 5 bbq grill gazebo which is super easy to put together. If you’re buying a unit for the first time then improper instructions of the assembly manual may frustrate you. 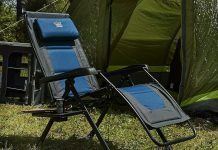 So it is better to go with a unit which is both sturdy and easy to assemble. 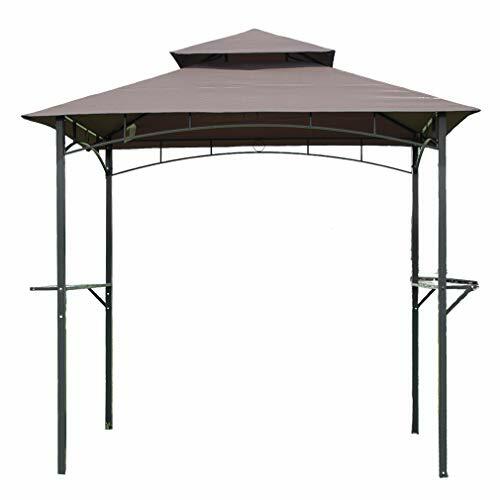 But apart from the easy assembly, this soft top canopy grill gazebo has many other features to offer. Let us focus on some of its amazing qualities. First of all, 8 X 5 footprint of the unit is good enough to fit almost all medium-sized grills. Secondly, its 180 g coated polyester fabric is built to last for years while protecting you from the sun. Not only does it protect you from UV rays but canopy fabric is strong enough to withstand rain and heavy winds. All thanks to its double tier roof that allows proper airflow and keeps rain and wind out. Also, the material is fire retardant which makes grilling under shade much more safer. 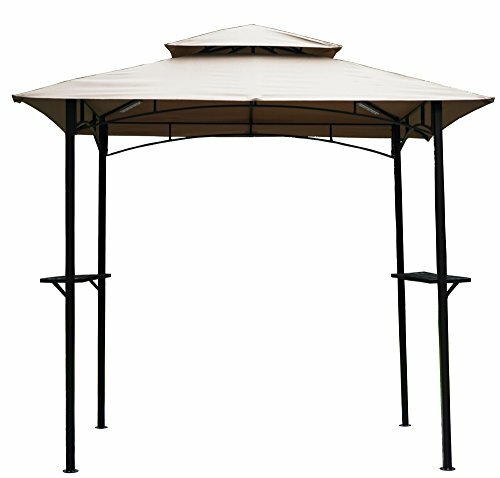 You can easily install the gazebo on your backyard, patio or pool area. The low maintenance grill gazebo comes with straightforward instructions and necessary hardware. However, the metal rooftop of grill gazebo needs two people for proper installation. Otherwise, rest of the parts are easy to put together all by yourself. So conclusively, it is one of the best grill gazeboes to buy if you’re looking for easy installation. Designed specifically to house a barbecue this bbq gazebo grill is just perfect for the purpose. Design of the unit is such that it can easily fit medium to large size of grills. And similar to many other units on the review list, this unit also comprises of a smoke vent on top. This smoke vent serves a double purpose. Firstly, it helps to maintain cool temperature beneath shade by throwing out hot air. Secondly, proper ventilation takes out smoke coming out from the grill. Roofing, just like other models on our best grill gazebo reviews is fire retardant. As you’ll be placing your favorite grill under it, it is obvious that canopy must be fire retardant. Not only will it keep you safe but it will also reduce potential fire hazards. Other than that, 2 iron mesh table on both the side provides ample space to put serving plates, seasoning ingredients, glasses, etc. Therefore, all your kids can comfortably eat delicious food in their own space. Soft top of this gazebo for a grill is easy to take off and clean. Therefore, you must take down canopy during heavy snowfall or hurricane in order to protect the material from damage. Besides that, legs of unit comprise holes to drill down grill gazebo securely on deck. Drilling will hold the unit more firmly than stakes. 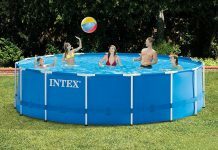 So yes, it is the best grillzebo for pool area and deck. Next, on our best grill gazebo reviews, we have an amazing product from Mastercanopy. Measuring 8X5 in size, it is big enough to fit almost all size of grills. Whereas khaki color of canopy blends well with any type of background. Be it a pool area, patio or deck, Mastercanopy soft top grill gazebo will look beautiful everywhere. But apart from having beautiful looks, the unit has a sturdy steel construction. This rustproof steel frame has a durable powder coated finish that prevents premature corrosion on the frame. Double tier top allows for maximum airflow under the canopy. This, in turn, helps to maintain cool temperature under shade even if it is too sunny outside. It also removes smoke coming out from the grill so that you can cook food peacefully. Speaking of the soft top, the canopy is UV treated, water resistant and fire retardant. Therefore, it means the color of cover will not fade away for a long time as well as protects you from potential fire hazards. The 2 handy shelves on side of master canopy bbq grill gazebo provide ample space to rest cooking tools, serving plates, glasses, etc. 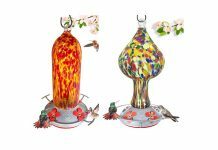 While hook in the middle of canopy allows you to hang light, fan or any other gazebo decor material. On the positive side, you get a free adsorbable lamp on buying the product. So in short, user-friendly features and beautiful color of the unit makes it one of the best outdoor grill gazebo. Here comes another sunjoy grill gazebo on our review list. The beautiful black color of this unit will surely enhance the beauty of your patio or backyard. Not only the modern design of product blends well with different backgrounds but it is also sturdy in construction. Credit behind durability of the product goes to its steel frame and hardtop roof. The steel frames with powder coated finish are resistant to rust. Whereas, hardtop canopy offers better stability during high winds and other such rough weather conditions. Good ventilation of sunjoy hardtop grill gazebo l-gg032pst0c helps in maintaining optimal temperature under shade. In addition, it removes excessive smoke emerging out of grill so that you can peacefully prepare a meal. While slant design of roof in combination with hardtop material accumulates less dirt and debris. This slant roof also helps to get rid of rainwater fast as water does not accumulate on the surface. Therefore, which makes it the best hardtop grill gazebo for rainy seasons. 3 large hooks on both the side of grillzebo provide a convenient place to hang your grilling tools. 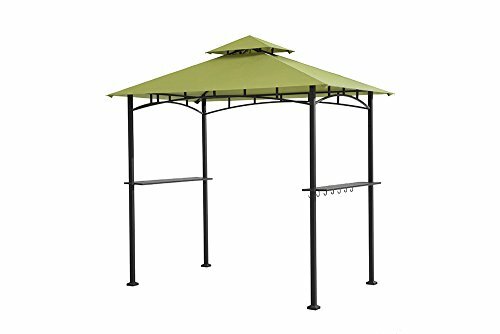 You can hang small plants or any other decorative material to enhance beauty your sunjoy hardtop grill gazebo. And similar to other sunjoy units, this model too offers shelves on both sides. There is ample of space to put all your cutlery and beverage glasses. Plus, built-in wine glass hangers are perfect to keep your favorite wine glasses in place. Need for storage area doubles when you have a number of members in your family. So we have Outsunny bbq grill gazebo comprising of storage area. This storage ares is nothing but a simple metal surface present right beneath the table. While the table is useful in serving delicious grilled food, the area beneath is helpful in storing extra plates, sauces and cutlery. In short, it is the best bbq grill gazebo in terms of space and storage. You can prepare tasty food right under cool shade without worrying about where to keep all the ingredients. Just like many other units on our best grill gazebo reviews, Outsunny also offers double layer ventilation. An opening at the apex of canopy allows for smoke and wind to be vented out from under your outdoor grilling session. 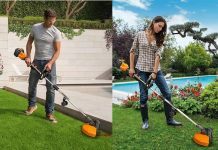 In turn, it helps in maintaining a fresh flow of air under shade so that you can completely enjoy the process of making food. Apart from that, UV-resistant canopy top offers protection from harmful rays of the sun while you’re busy flipping burgers on the grill. Powder coating on metal frames is resistant to rust and corrosion. And apart from providing solid durability, it helps in maintaining the fresh look of grillzebo. Whereas, 6 metal hooks on the side are ideal for hanging cooking utensils and tools. Moreover, easy to follow instruction make assembling of product a breeze. It will hardly take an hour and a half to put all parts of this bbq grill gazebo together by yourself. Side shelves make a perfect place to rest grill accessories, plates, drinks, etc. Its time to bright up your backyard with sunjoy 8 X 5 soft top grill gazebo. Available in red, green and gray color, the unit easily blends with any decor. Not only is it good in looks but sunjoy offers a product having great durability. 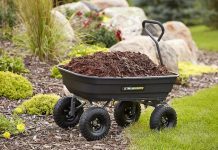 Thanks to its sturdy steel and aluminum construction with a rust-resistant, powder coated finish that will last for years. 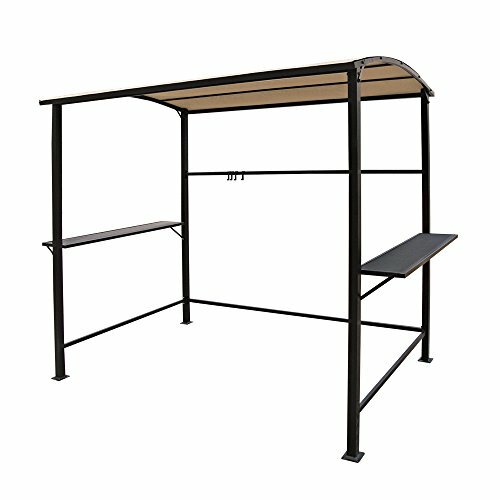 While the durable steel framework provides stability to the unit, its soft top canopy provides safety from harmful UV rays. Furthermore, 100% polyester fabric can tolerate high summer temperatures without fading away color. Also, the unique design of canopy allows wind to pass through properly so as to stabilize unit in windy conditions. So the soft top and metal construction together holds sunjoy grill gazebo firmly during adverse weather conditions. Besides, 8′ X 5′ footprint of the unit accommodates almost all size of grills. Thus, you can enjoy grilling session under the cool shade of beautiful grillzebo that will last for a long while. The two handy shelves on the side provide ample space to rest cooking accessories, food, and beverages. In addition, it also comprises of a couple of hooks on one side to hang grilling tools. And above all, the price of the product is not too high to burn a hole in your pocket. 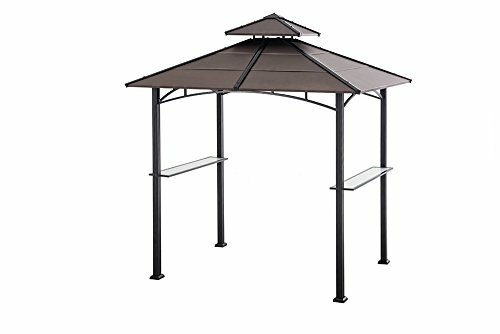 It stands as one of the best cheap grill gazebo from sunjoy in terms of looks, construction, and money. If the area where you live is quite windy and shade is your only requirement then here’s a product for you. The cobana 1-tier grill gazebo is perfect for the poolside area, patio, and backyard. In spite of double venting system, it comprises of simple polyester fabric on top. This durable polyester fabric is painted with waterproof material to protect your grill during the rainy season. Also, the color will not fade away easily while protecting you and your favorite grill from harmful UV rays of the sun. And it is very easy to clean the cover in case dirt and debris accumulate over it. Just like the majority of models on our best gazebo grill reviews, this unit also features side metal shelves. The 45″ X 9.8″ grid metal table on sides are best for resting grill accessories, tableware and food. You can also comfortably eat using side tables as a metal rod on bottom helps to rest your legs while you’re enjoying tasty burger patties with beautiful sear marks. The 4 extra pot hooks are ideal for hanging bbq tools. Or else, you can hang some decorative item or mini plants on them. In order to make the unit stand stable on the ground, cobana 1-tier outdoor grill gazebo comprises of square feet. You can screw down the 4 ‘tent peg’ holes in case you wish to install the unit on a concrete surface. This way it will stand more firmly against heavy winds. So conclusively, it is an excellent grill gazebo if the shade is your only need. In case you wish to have ventilation, cobana also offers a 2-tier top unit. 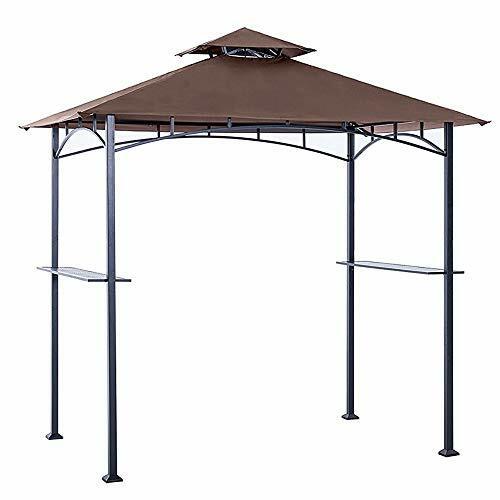 When buying a grill gazebo always measure the size of your grill and buy the gazebo with sufficient inner space so that you can move easily and the canopy should also be able to cover you. 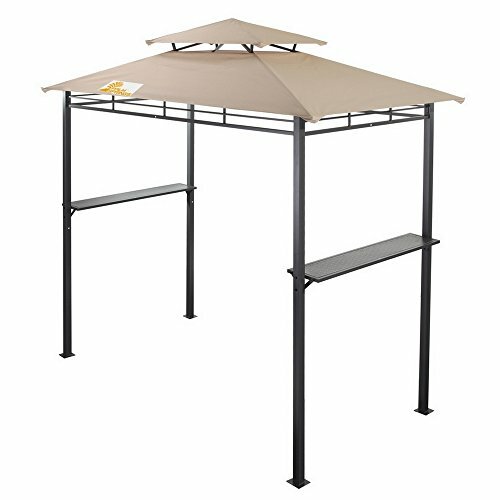 Good gazebos also have racks built in the frame to give you more space to keep BBQ tools. Such racks also come handy in serving people right out from the grill. 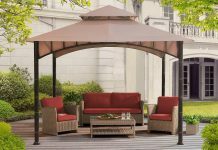 In this grill gazebo reviews, we made sure to include only top rated and premium units.